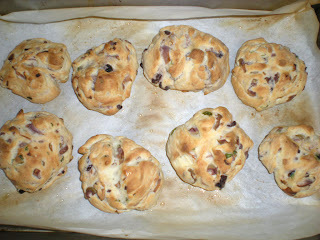 Last year, my Mexican friend Mon made a scrumptious and flavorful olive bread and the taste was unforgettable. My bro and I missed the taste of this bread that we made our own Mediterranean bread. We had some leftover ingredients from the Mediterranean Risotto and incorporated into our bread. We then divided the dough into smaller portions so that we can also give it to a few of our friends. Feel free to change/add a fair amount of ingredients, but do not overload with ingredients otherwise the dough will not rise. 1. In a small skillet, heat olive oil over medium heat. Cook onions until transparent. 2. 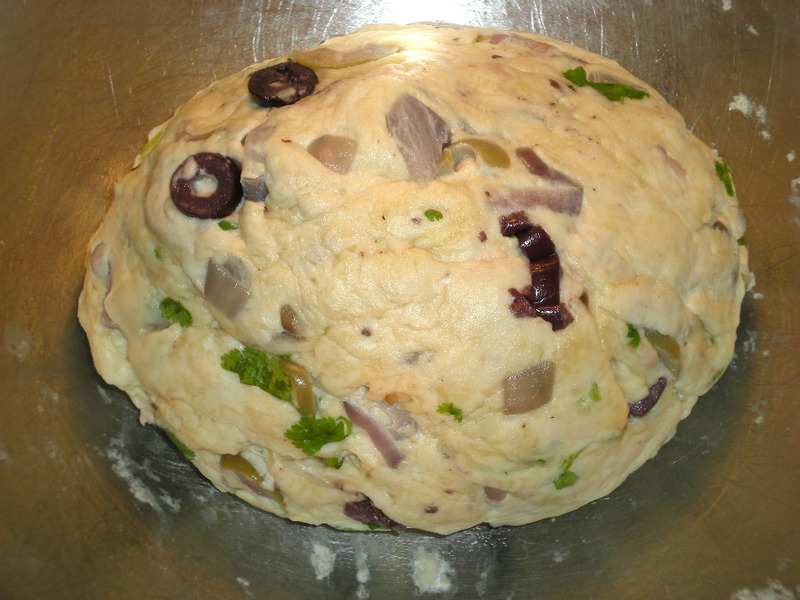 Combine flour, olive oil, salt, yeast, parsley, onions, olives, sun-dried tomatoes. Add enough water to make a soft dough. 3. Transfer to a lightly floured surface and knead until smooth and elastic. Put it into a bowl and cover with warm cloth. Put bowl in the oven with lights on until double in size. 4. 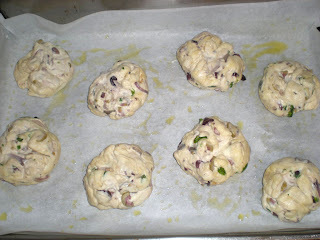 Cut dough in half and let it sit in the oven until double in size about 20 mins. 5. Preheat oven to 425F. Lightly grease baking sheet. 6. Shape dough into 8 small rolls. Make a cross on each roll with a sharp knife. 7. Bake for 25 mins until rolls sound hollow when tapped on the bottom. Bake 30-40 mins for loaf. 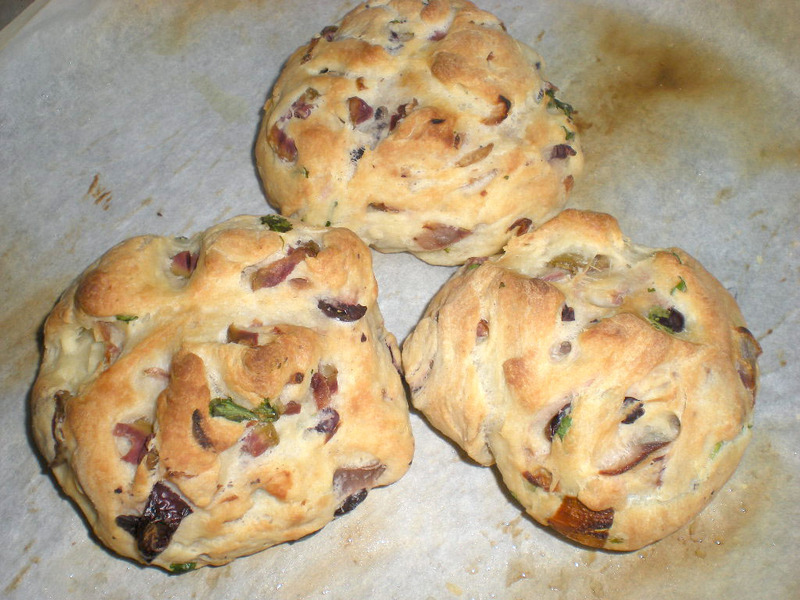 Great bread, I love it when rolls have such flavorful elements added in. 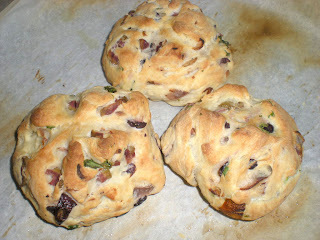 Stumbled down from another blogroll..bread looks delicious and great!! nice space..
cheers and do visit me if you can following your blog! this looks delicious n gorgeous too!